I’m Lirie Lokaj. Actually, my second last name is Mazreku, with which I’m not completely used to yet, and often forget to mention it. Sometimes it’s surprising how the brain needs time to get used to a new name, but not to perform infinitely complicated cognitive functions within a few moments. Or maybe, sometimes we concentrate to look beyond ourselves, and forget about the important things that we have around us. including the additional vocational education in Family and Systemic Psychotherapy, Online Counselling, acquiring the license as a clinical psychologist and other psychotherapy related trainings. I worked mainly on local and international organizations in the social and educational fields. Currently, I am working in a highly successful USAID’s Basic Education Program. In the afternoons, I apply my profession as a psychologist in Clinical Psychological Ambulance, which I co-founded, called “UNI”. 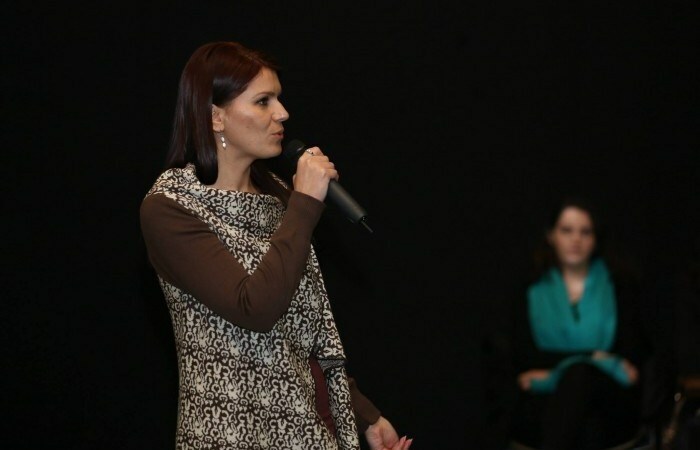 I had the opportunity to be part of IPKO Foundation activities in February 2015 as one of the speakers of BarCamp Prishtina. To be completely honest, it was among the most exciting things I’ve ever done in my life, but a stressful experience as well. Since I had only heard about BarCamp a little while before the invitation, and I had never had the opportunity to be present in the audience, I was not aware of the format that much. In addition, I wasn’t so sure if I had something interesting to share with the audience. However, I think that deep down the reason why I decided to accept the invitation, was for the opportunity to have a new emotional experience. My expectations for BarCamp were fulfilled, because it turned out to be a really exciting experience. It is incredible how we can feel free to share personal things with so many unknown people, things that, perhaps until now, we have only shared with our close ones. IF has managed to create this kind of atmosphere through this activity. It’s surprising how BarCamp has collected a very unique and mature audience, young men and women who are focused on acquiring new knowledge, even through the modest experiences of others. Despite their daily commitments they wanted to spend their leisure time in an activity different from the usual one of just grabbing a coffee. This can breed a new spirit in our youth, and perhaps it can create a new ritual that will bring us positive change. We really need this! I felt very happy that even in other editions there were a lot of participants, many young people who seek for information, motivation, inspiration, criticism, even flirting, or whichever the reason of their participation is. Whenever I will have the opportunity, I will gladly follow every edition of BarCamp or other similar activities organized by IPKO Foundation.